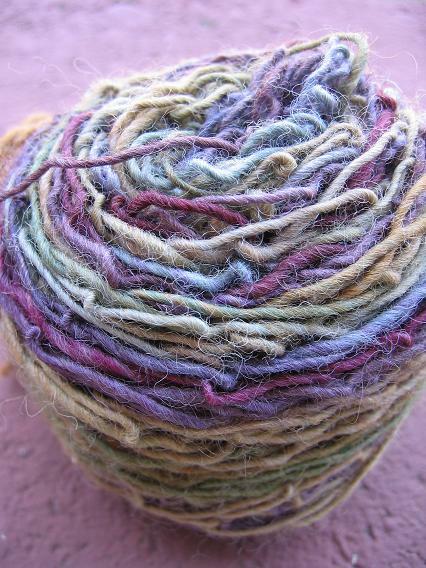 Starting with that theme, when I think of the epitome of yarn, I think handspun-- yarn that has passed from sheep thru human hands and mind into this unique form chosen by the artist... the weight, the color, the composition all chosen and varied as seen fit by the individual at the wheel. Socks. A sock. A weekend sock. I've dug this cable (PDF!) for forever and think it fits in well both literally and figuratively to the yarn theme-- using literal yarn for the project, and taking the figurative idea of composition, of the elemental strands (singular bits of yarn, if you please) that make us up (as Grace's badass yarn makes up this sock), and representing it physically within the project. 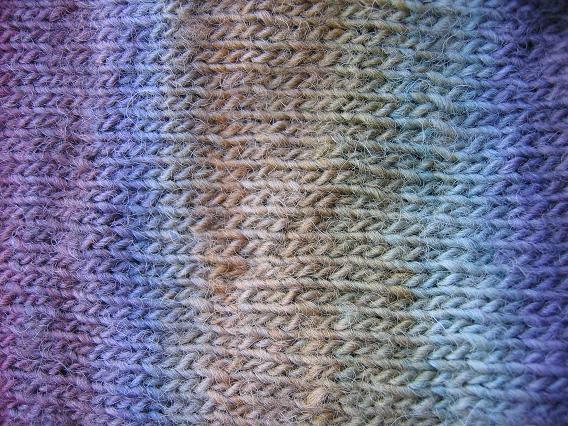 The color bands of the yarn are also reminiscent of the quaternary sequencing (a c t g) of DNA... not quite ordered but ordered enough within themselves. I think it fits. I also think I'm a super cheeseball. Commence short row heel, placing markers to denote the center 10 sts of the heel. 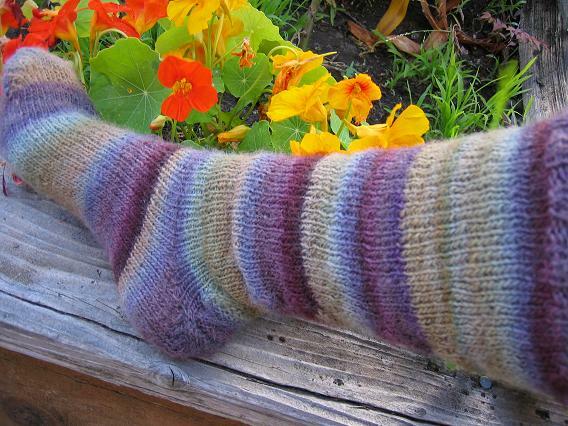 As the increases for the heel begin, work the center panel of the double helix cable (starting with row 3, sts 5-15) and increase cable pattern as more sts become available as short row heel is completed. The cable pattern is a 20 st pattern, the heel needle will carry 24-- so note there are 2 extra sts on each side of the cable to keep it centered. Work one repeat of cable, modifying it to maintain a stockinette background (no purl sts on the outside of the helix when working with the cable needle, etc.). Switch to US 3 needle, work 1 repeat of pattern. Switch to US 4 needle. Still maintaining stockinette border around cable, increase 2 sts every other row for 6 rows (6 sts total increased)-- work 1" as set, then increase 2 sts every other row for 4 rows (4 sts total increased). I used a m1r/m1l on the opposite sides of the cable for increases. Continue knitting cable repeat, ending on row 40. Knit 2x2 knit/purl ribbing for approx. 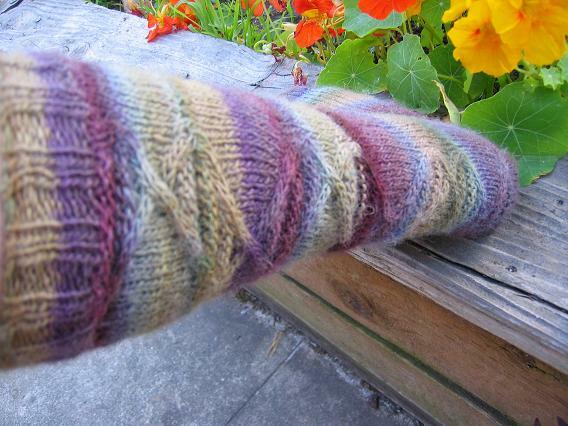 2" and use stretchy bind off-- I used the one in Simple Socks that grafts the ribs together. 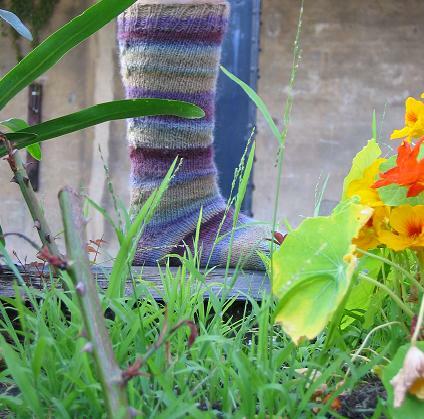 The sock is definitely a tight fit with negative ease representing the east side; keeping it all in stockinette and with no ribbing or shaping of a gusseted flap heel, I wanted to make sure it was very fit to my foot. This is the longest sock I've knit, and makes me want a pair to hit under my knees now-- true knee highs :) There is a bit of tightness in getting the sock on over the heel (jaywalkers, anyone?) simply b/c the cable (where I pull my heel against when putting it on) is not stretchy at all, and the foot portion is already designed with negative ease. The cable also acts to help keep the plain stockinette conformed to the leg, but is not as stretchy as a "normal" cable or ribbing. I've used the stretchy bind off from Simple Socks before, but need to remember not to pull the grafts tight-- it defeats the purpose. As it is, the cuff isn't binding at all. 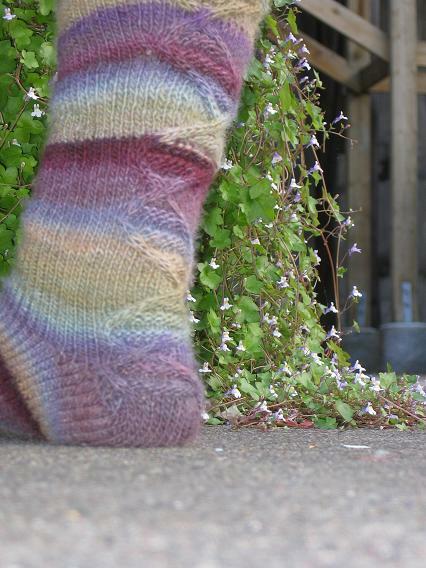 I am going to make its pair up soon (but not right away), I have Hedera to finish and other odds and ends-- I want to start Devan from Knitty, and knit a new dream swatch headwrap (PDF!!) in koigu. Its too warm to wear this substantial sock right now as well-- but will be pretty cool when it cools off again. What a visually pleasing display of your gorgeous sock! The helix is very cool - makes me want to try it some day. I hope you win the book! I'm not a judge but, if I were, I'd vote for you! That is one incredible sock. yes indeed!! the helix s very cool!! great use for it. and I love the colors. I thought it was Noro silk garden. Love it! Interesting cable pattern. I'll still have to learn short row heels before I can try it, though! I was reading a different method in a book at the store the other day, and I may try that! Wonderful sock. Love the colors and the crisscross pattern on the back. I can only dream of being able to knit a sock! Great job! 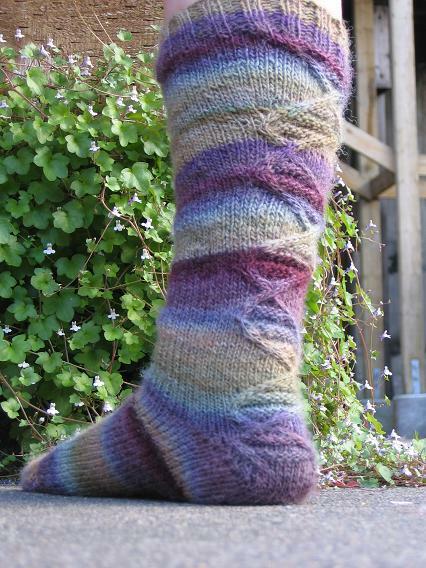 Gorgeous, gorgeous sock - I think it's a brilliant use of that cable! Fantastic! Thanks so much for the pictures and the instructions. I love the juxtaposition of the helix and the color stripes. I love that sock so much! What it reminds me of is those ballerina shoes that lace up your leg. Gorgeous! Oh, what a beautiful sock! 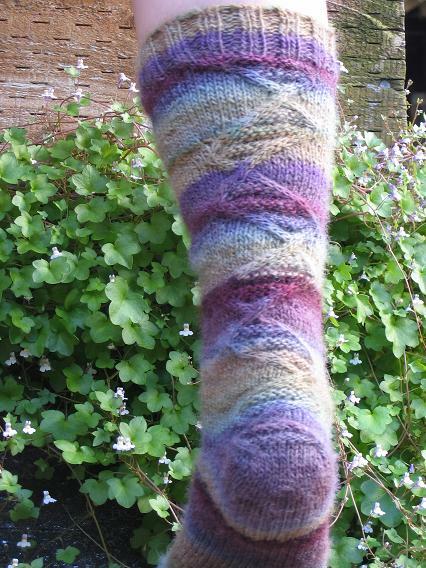 That yarn is just stunning, and your cable pattern works really well.